Malaria is infectious disease, which can be life threatening if not cured in time. This is caused by plasmodium parasite, which is spread from person to person through Anopheles mosquito bite. How can malaria be prevented? This one of the common question arises when we think of malaria. You need to be worried about it as malaria can be effectively prevented and cured. Some of the common symptoms of malaria that you should look for include fever, vomiting, fatigue, and headaches. If malaria is not treated in time, it can turn into severe malaria and can result into seizure, yellow skin, coma, and even death. Malaria can be effectively treated with the help of Antimalarial medications. Artemisinin-based combination therapy (ACT) is the W.H.O recommended malaria treatment. We all know that prevention is always better than cure. So, concentrating on prevention is always better. 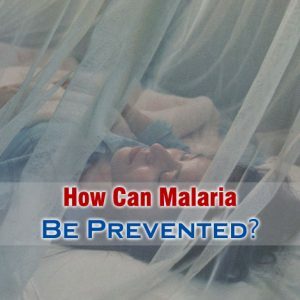 Prevention of malaria concentrates mainly on prevention of mosquito bite and prevention of mosquito breeding. So, How Can Malaria Be Prevented At Home? Using of mosquito nets is best method of preventing malaria. This helps in preventing mosquito bite, thereby prevents the spread of malaria. This is most cost effective method of preventing malaria spread. Male sure to purchase a insecticide treated mosquito net. When you are searching for how can malaria be prevented, make sure that purchase insecticide repellent spray containing DEET(N,N diethylmetatoluamide). Using this spray will another effective method for prevention of malaria transmission. Spray them in all living areas and bedrooms during evening and nighttimes. Wearing protective clothes will also help in preventing mosquito bite. Wear shirts with long sleeves, and long pants will be helpful. Wearing socks will be added benefit. Sleeping light colored dress is also helpful as mosquitoes get attracted to dark colored dresses. Apply mosquito repellent creams on the naked areas on your body, when you are sleeping outside or in a place where there are many mosquitoes. Applying during evening or nighttime is beneficial in preventing mosquito bite. However, it is advisable if you apply during daytime as sometimes, mosquitoes can bite even during daytime. If you are planning to travel to some remote place or some country, which are prone to spread of malaria then it advisable to take antimalarial drugs along with you. Taking antimalarial drugs such as chemoprophylaxis will help in suppressing blood stage of malaria infection.